V notch adapters for compression testing. 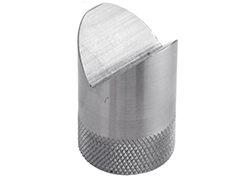 These adapters are used in compression for the testing of cylindrical and round parts such as tubing and piping where centering is critical to the test. The V notch adapter helps keep the part centered during the test.